We have always loved this saint because she was so lovable, so beautiful, young, holy, and so much in love with her husband. It is refreshing to find a saint who made a fool of herself over her husband, and St. Elizabeth surely did (or so the court thought, at any rate). The legend that the bread in her basket turned to roses is probably not authentic, but it could have happened; so we like to tell it each year. Elizabeth is supposed to have been taking bread to the poor and met her husband, King Ludwig, on the way. He asked what was in her basket, lifted the napkin, and there underneath he found roses. Elizabeth, full of humility, was not exposed as the great benefactress of the poor. This is not consistent with her reputation for openly giving away to the poor everything thing she could get her hands on, but it is a charming story and gives us the cue for our St. Elizabeth’s Day custom. We bake bread that afternoon so that it will be done by nightfall. It is shaped into large buns – or small loaves (if you prefer), wrapped carefully in linen napkins, and put into baskets. The children bundle up, get their flashlights, take notes explaining the day and the custom, and go off down the lane to the neighbors with hot bread for their suppers. It is given away for the love of Christ. Then, when you return home, the bread for your own supper tastes that much sweeter. He is the patron of the unhappily married, and since everyone who ever gets married thinks sooner or later that he is unhappily married, it is high time we stirred up devotion to this saint. He is probably an expert at showing up for what they are all hurt feelings, self-pity, piggishness, and all the other things we suffer or perpetrate but don’t admit. For those truly unhappily married, I am sure that he will show them that eternal happiness is bought with such sufferings as theirs. Omer Engelbert writes of him: “Courageous soldier and relative of Pepin the Short, who thought to reward him by making him marry Gwin Marie; he suffered terribly from the frightful disposition of this incorrigible woman. So this saint knows what an unhappy marriage is all about. He is also the patron of woodcutters, turners, glove-makers, and cowherds, and is invoked against hernia. Coloring pages for this wonderful Anniversary! Harvest Beauty Apron! Feminine and Beautiful! 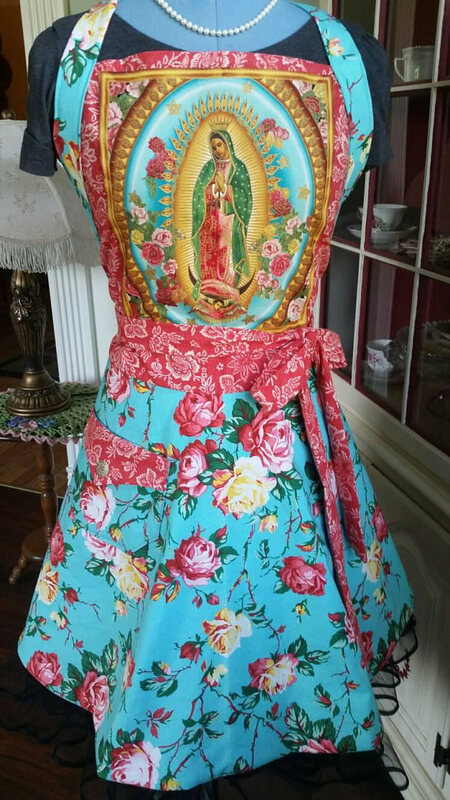 Make a statement with this lovely and graceful “Harvest Beauty” handcrafted apron….fully lined….made with care. Aprons tell a beautiful story…..a story of love and sacrifice….of baking bread and mopping floors, of planting seeds and household chores. Sadly, many women have tossed the aprons aside and donned their business attire. Wear your apron with joy….it is a symbol of Femininity….”Finer” Femininity! Happy Great Feast Day – Our Lady of Fatima! St. Elizabeth of Hungary is much loved in our home…her feast day was the day my hubby proposed to me. 🙂 However, her feast is on Nov. 19th, not 17th. Not sure if that was a misprint or maybe the new calendar? I never heard of St. Gomer! Thanks for bringing him to our attention. I just adore the writing style of Mary Reed Newland. Thanks for the correction on the date, Erica.